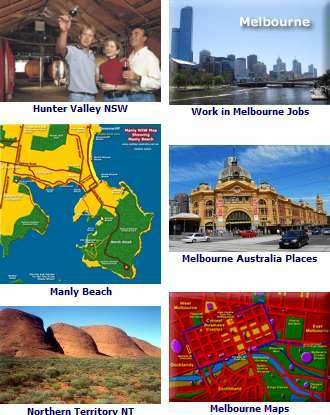 See the Map of Greater Sydney and Surrounds. Open 10.30am to 3.30pm Sat and Sun. This house museum, built around 1835, stands on the original 1789 land grant to James Ruse, who created the first successful farm in Australia. Open 10.30am to 3pm (last tour) Wed to Sun. Featherdale Wildlife Park offers one of Australia largest native wildlife collections, over 2000 animals. Visitors are encouraged to get up close and personal with Australia native heritage. Cuddle a koala, hand feed kangaroos, wallabies and emus. Relax with us in the peaceful country atmosphere of our fully restored 1820 tearooms and restuarant. Home cooking, log fires and the aroma of bygone times. Lot 1 Mamre Rd. Turn off the M4 at Mamre Rd. Cultural Museum, Boomerang throwing, Didjeridoo Presentations, Native Plant walk and Retail Gallery. Cruise the spectacular Nepean Gorge in the Blue Mountains National Park for Morning or Afternoon Tea, Lunch or Dinner. Aqua Golf, video games and live entertainment, restaurants and cafe, shows at the Evan Theatre. Parramatta played an important role in the early colonial years and has now grown into a thriving Western Sydney suburb. There are regular trains from the city and a fast jetcat service over Sydney Harbour with its glorious views, then up the Parramatta River. Jetcats depart from Circular Quay, also in the city. Great Shopping, including speciality shops and an growing collection of restaurants make Parramatta a tourist destination, but it has kept much of its historical roots. Where the rowing and canoeing events were held at the Sydney 2000 Olympic Games, including the Sydney International Regatta Centre, Penrith Whitewater Stadium, Muru Mittigar Aboriginal and Education Centre and the Penrith Lakes Environmental Centre. Penrith Valley is the location of the world renowned Sydney International Regatta Centre - with picnic and BBQ facilities, rowing, canoeing, dragon boats, club fishing, and sailing. Muru Mittigar, the Aboriginal Culture and Education Centre is well worth visiting. Penrith is at the base of the Blue Mountains. Australia’s one and only Sake Brewery. Visit the factory and Visitors Centre to learn about the tradition, culture and production process of this 2000 year old drink. Taste and buy sake products made here in Penrith from Australian rice. 2000 Oympics Site - Rowing, Canoeing, Dragon Boats, Sailing, Triathlon and Tandem Skydiving at the beautiful Penrith Lakes. There are Picnic and BBQ Facilities as well as walking and cycling tracks. For the whole family to enjoy. Sydney’s greatest sporting venue, offering restaurants, cafes as well as being the venue for many of Australia’s major sporting and special events. Wine tastings - relaxing wine gardens - woolshed dances - Craft Markets 2nd Sunday every month. Wet’n’Wild has tons of activities for the kids. Water slides from the small to the huge for different ages, a giant tipping bucket, watersprays, an amazing place to surf with perfect waves at the Surf Deck, the Sydney Skycoaster, swimming and lots of shaded places to rest inbetween. You can also swim.